Warning: This CV is really just an excuse for me to shared my life story. So it will be very long, and probably quite boring for most. If, as you read it, you decide you’d like to do something with me or have some use for me, just drop me a line. I was born on April 4, 1960, in Via Trieste n.3 in Loreto, at 7.30 in the morning on a Monday – just in time to go to work. I was born at home rather than in a hospital. In those days it was still the custom to do so, and in my case it went well. As soon as I gained some common sense, I found myself surrounded by brothers and sisters; my earliest recollections are of three; they gradually became six. Here we are in order of age: Antonio (me), Daniele, Ester, Elena, Massimo, Fabiola and Paolo. In the fall of 1965 my parents enrolled me in a kindergarten run by nuns. At lunchtime, kids from the nearby elementary school joined us in the cafeteria. Intrigued by their elegant black smocks and white bows, one afternoon I sneaked in among the line of first graders re-entering class after lunch. Once I was inside the classroom the teacher, a wonderful woman, didn’t scold me but laughed instead, and kept me there. To make a long story short, they ended up adopting me and I began first grade a year early. At school I excelled immediately, and I earned the respect and gratitude of my classmates by often offering, even proudly, to let them copy my homework and correcting their homework as well. This I continued doing over my entire scholastic career. There was only one subject that concerned my parents, and which would remain a thorn in everyone’s side throughout my school years: Conduct. I did extremely well in everything, but I always compensated with bad marks in Conduct. Those were great times: school was fun, and was followed by 3 months at the sea at nearby Porto Recanati on the Adriatic sea near Ancona. I went on to middle school, but the story didn’t change; I performed well in all subjects except for Conduct. In seventh grade, intoxicated by listening to the news too much (this was in 1972), I organized the first student strike because the principal wanted to replace our literature teacher midway through the year. So for 3 days the principal and teachers, incredulous, watched as 200 to 300 screaming brats raised havoc in the square below, shouting slogans (some were not very elegant; it wasn’t our fault though if the new teacher’s name was Panzavuota – empty belly). On the third day the local newspapers even carried articles about the strike, and the principal decided to negotiate with us. I was the head of the student delegation. When the principal found out (“but why, Antonio, you’re such a good boy!“) he threw me a curve ball and called my father who, of course, I had been very careful to keep in the dark about my adventure. You can imagine what followed. And, in all fairness, I must confess that the new teacher, Mrs. Panzavuota, was without a doubt one of the best teachers I ever had, much better than the previous teacher whose position our strike was attempting to defend. I frequented the church and soccer field of Via Trieste since early childhood. In soccer, I was the goalkeeper. I finished middle school with a nice “Optimum” on the exams, something that calmed my parents’ wrath about my grades in Conduct. I enrolled in the Scientific High School of Osimo. This was in 1974. It was a hard life. At that time the best connection, by bus, left Loreto at 6:45 in the morning, so I had to get up at 6:00 sharp. I did this for five very long years, every day, and I consider myself to be a hero for this. The camaraderie in my class wasn’t that great and I never really became very close to my classmates. I seemed to fit in better with the students of the other section, who came to school by bus like me from Castelfidardo. In those years – as is the case for everyone – a lot of things happened: I fell in love with Patrizia (who I later married in 1987 after a 10 year engagement); I attended the ACR youth group (Italian Catholic Action) which became the outlet for my desire to contribute to society; I continued to do well in school and – this was something new – I started to take studying seriously. Anna Ricci, my outstanding literature teacher who is now retired, helped me to fall in love with grammar and poetry. Furthermore (surprise surprise) she gave me a 10 in Conduct because she loved lively students! WOW! Another fantastic teacher (whose name I’m afraid I’ve forgotten; I only remember that she was born in Ascoli Satriano) led me to fall in love with philosophy, with my first memorable homework assignment being a commentary on the Life of Galileo by Brecht. I made it to the high school leaving examination, in 1978, covering philosophy and physics (with the philosophy essay on Antonio Gramsci and the physics essay on the new black hole theory) and passed with 60/60. For a few weeks after the exam I continued to study for the admission exam to Normale di Pisa University where I would have liked to pursue a Computer Science degree. But the pull of the sea was just too strong, and I dropped everything. So I found myself enrolled in the law faculty of the Macerata University. I excelled here too. At the end of May 1981 (halfway through my third year) I had already taken 21 of the 26 required exams, and 21 grades of 30/30, most with honours. In the meantime I continued to be active with Italian Catholic Action. In Rome I lived in the room of a building at the beginning of via Aurelia, near Piazza San Pietro, and I had my office in the tower block of Via della Conciliazione 1. The city is a real marvel. In those years I learned to love even the Romans, the most cynical people of the world, forced into such cynicism as a means of self-defense, and capable of turning it into a unique form of everyday humour. And I fell in love with the city of Rome, undoubtedly the most beautiful city in the world. It was in Rome that I experienced the emotions of the World Cup in Spain, with Italy becoming the world champions – this was in 1982. Those were busy years. The youth section I led (ACR) played an increasingly important role within Italian Catholic Action. An association with a glorious history, but at that time already reduced (I was reluctant to admit) to a launching pad to a para-journalist career in RAI or, alternatively, a political career in the Christian Democracy (Rosy Bindi being the latest example). I didn’t care at all about one or the other, and instead I became involved in opposing this manner of doing things that destroyed the association and enslaved it to ill-concealed purposes that were anything but ideal. For this I earned the wrath of almost all the other directors. 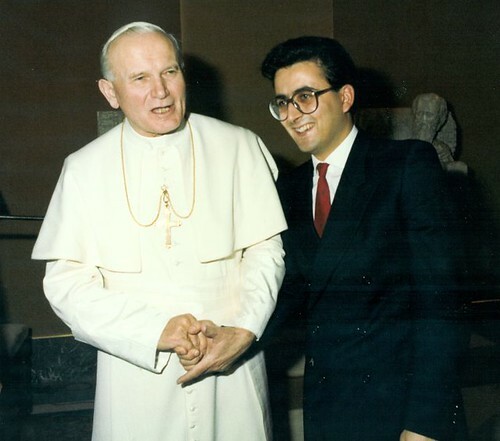 On the positive side, I had the opportunity to meet and get to know on several occasions and privately, Giovanni Paolo II: a wonderful man who over the following years reduced the Roman Curia and the CEI to silence and insignificance. As a conscientious objector to the use of arms, as they called it back then, in the Roman years I performed civil service instead of military service at the Prison and Community Association of Father Germano Greganti. Some memorable scenes: I find myself writing a love letter on behalf of a prisoner to his beloved (imaginary, of course); one of the prisoners is sniffing, and one of the Sisters (Sister Gervasia) sees this and asks Marco, what is that there? And he angelically says Try it Sister, you open it and inhale, like this… and the Sister takes a big sniff herself; a fight breaks out between two prisoners, I try to break them up and just get kicked in the right place a couple of times, but luckily one of my colleagues arrives, another non-violent objector who – armed with an iron bar – starts running after one of the two belligerents yelling at him “Stop so I can kill you, I’m going to kill you!”. graded 28/30 and one 27/30. All the others were marked 30/30 with various honours here and there. The biggest reward was hearing my thesis supervisor, professor Pierfranco Ventura, start off by saying, “This thesis is one of the most advanced points in the studies and interpretation of Martin Heidegger’s thought, and it deserves to be discussed not here, but in Tübingen“. I received my Law degree on November 5, 1986 with 110/110 and honours. It was time to marry Patrizia. We had been engaged since 1977: for certain things there comes a time when you either decide to do it or you ruin everything, and I didn’t want to ruin everything. There was only one problem: I didn’t have the faintest idea where my income would come from, something that I had never worried about before. Should I be a lawyer? Right, in order to start bringing home some money after three or four years of “practice”. And in the meantime? I started working as an investment funds and life insurance policy salesman with Programma Italia spa, the newly created company that at the time belonged to Ennio Doris (now president of Banca Mediolanum) and Silvio Berlusconi. Thus I learned what it means to be a door-to-door salesman. I also learned the power of hypocrisy: none of my colleagues wanted to call themselves “salesmen”, and they would have shuddered at just the thought of doing that for a living: some were “global consultants”, some were “financial consultants”, others were “financial advisors”…I didn’t last long there either. They promised me a career advancement if I achieved a certain result. I achieved the result, but received no promotion, so I left. Looking around at one opportunity after another left, right and center, I ran into Poltrona Frau, a beautiful and famous company of Le Marche province. I was hired there in 1987 and I earned some money for two years while learning a lot of things. I left Poltrona Frau in 1990 to earn a little more (I really needed it, I already had two kids and a mortgage on the house!) in a small company in Tolentino in the same business as Poltrona Frau: Valdichienti. We came to an agreement: when I reached a certain sales threshold, I would become an executive. After two years I achieved the result. But the boss changed his mind (this seems to be a common defect in bosses). We had a falling out, and I left the company. This was in 1993. In the meantime an ex-colleague of Poltrona Frau was also on the outs with his company. We met up, and we founded together a design and engineering company for furnishing products. I named the company Link srl. Internet – at least in Italy – was non-existent, but evidently it was my destiny! of the company. But the boss, once again, changed his mind. This was in June 1997, and I left. I had discovered the Internet in the meantime and I was thrilled about it. Not of the “means”, because Internet is not a means, but of the place, since Internet is a place, a place that wasn’t there before, where you can meet people you never would have met before and do things you never would have been able to do before. I was fascinated with it like I was with gastronomy, and I got it in my head to create a shop-site, to sell products I would have selected from all over Italy. I worked on the idea for a year and a half, involving Paolo, my youngest brother, and Lorenzo Giuggiolini, my lifelong friend. In February 1998 Esperya snc was created, and in September the site, Esperya.com, was online. It was an immediate success, and attracted the attention of experts and journalists. We didn’t look for buyers, but they sought us out: in July 1999 we signed an agreement with Kataweb spa, through which we transferred 70% of Esperya in exchange for a little money (I later discovered that we asked for much too little) and the possibility of managing something bigger and more important. It was a wonderful experience. But this too came to an end: on April 8, 2002 I discovered that on April 4, the day of my 42nd birthday, someone had the great idea of firing me. I responded by putting together my own marketplace, Antoniotombolini.com, with lots of stands. Selling with stands in a marketplace: this is in my opinion the true essence of ecommerce. Subsequently I’ve founded my own stand, a bookstand – electronic books of course – and it’s called Simplicissimus Book Farm. In the meantime, on the personal side, our daughter Matilde was born on September 12, 2003. Stefano is now 15, and Caterina is 13. The arrival of Matilde literally revolutionized, and happily so, our family structure. September 2005. I’m working on the creation of the Web Division of the San Lorenzo company of Imperia. Along with that, I’m also working on the creation of the Simplicissimus Blog Farm. Swept away by the referendum campaign to repeal law n. 40/2004 on artificial embryonic fertilization, I got back into politics, this time as a radical. On August 28 2005 with my friend Andrea Vecoli, I founded an electronic political association called Lievito Riformatore. also – perhaps above all – necessary to change the terms used). with the new display technology made possible by E Ink, and the dedicated readers derived from it, a probable and finally significant relaunch of ebooks and electronic publishing in Italy. In the meantime Stefano graduated from Classical High School with 100/100 and has enrolled in Medicine at Bologna: I think he wants to be a neurologist when he grows up, at least that’s what he says now. Caterina is in twelfth grade at the Scientific High School, and Matilde has started to attend preschool, to her great enjoyment (even at the price of catching frequent colds and bronchitis), at the wonderful age of 3. October 2007: Damn! Things just keep happening! Work: San Lorenzo is going well, we’re growing in Italy and investing heavily in England and Germany. For these areas I hired Sara Maternini and Matthias Metze, some really good guys, to work with me. In January 2007 my Simplicissimus Book Farm signed a distribution agreement for Italy with iLiad, the Ferrari of ebook reading (and writing!) devices, and things are going quite well. While I’m writing this we’re in the final negotiation phase with the French Bookeen in order to obtain Cybook Gen3 distribution for Italy as well. Well, it seems that my suspicions about the fact that electronic ink-based devices would unlock the digital reading and writing market were not far off. But since it’s never enough for me, I started working as a cook: for real! On the weekends, on Friday and Saturday evenings, I become Chef de Cuisine in the restaurant of the wine shop my wife Patrizia opened last July with her sister Fabiola: Enoteca Sorelle Dalpiano in Osamo. Come and visit us! April 2010: Work: the Simplicissimus Book Farm is going great for now. The intuition I had five years ago is proving to be right (for me it was clearly right from the beginning, ha ha), and now ebooks are a hot topic in the publishing business: ten people now work in our publishing company! Family: Stefano discovered, after his first year in Medicine and a string of good grades, that he can’t handle bloody scenes very well, and so he’s enrolled in Economics at Ancona where he’s now in his third year. Caterina is at the SOAS in London studying Chinese, and next September she’ll be starting a year in Beijing. Matilde started school: she’s in first grade, and has already learned to read and write. Patrizia works on the accounting for Simplicissimus. And just a few days ago, on Easter day to be precise, I had my 50th birthday, celebrating it like this. a dog, an extraordinary 15-month-old Bobtail that has transformed our life once again. Patrizia has always been terrified of dogs, and now it’s all hugs and kisses with her Monella, who receives from her the care and attention of a true mother. Monella repays us all with outstanding dedication and affection: she’s good, nice and friendly with everyone, dogs and humans alike, a true example of life, and I’m not exaggerating. You can find the photographic chronicles of our adventure with Monella, of course, in Monelliade. This year, on August 29th to be precise, marks the 25th anniversary of our marriage, and we’ll celebrate it pedaling! With Matilde and Monella, we’ll be doing the Passau – Vienna bike tour at the beginning of September. July 2014: Work: so, it looks like I’m not so bad at fundraising; we were able to raise some 2.5M € from Principia sgr, one of the major Italian VC funds, in December 2012. Our business is more than doubling, and the team includes now a bunch of great colleagues from Poland, Turkey, the US, Mexico, Spain, Germany, Chile… small and global, this is what Simplicissimus is going to be, and it’s exciting. As for my family, remember our plan to celebrate the 25th anniversary of our marriage by pedaling the Donau River? It never happened. I lost my beloved father, Paolino, on September 11th. He was 79, and believe me, his life could easily fill several interesting volumes. Since then Stefano (who is now 26) got his MBA with a specialty in statistics and completed an internship as Data Scientist in the digital division of the Italian bank Unicredit: it looks like crunching numbers is a true passion to him. Caterina (now 24) graduated in Chinese at the SOAS in London in June of 2013 and she’s currently acting as a marketing manager for Yoox China in Shanghai. Matilde (now 10) is celebrating her first academic achievement, having successfully completed the fifth class at primary school. Monella, now 3, is the greatest dog one could hope for: she’s a true member of our family and not the least savvy of them. And most important: Patrizia is still tolerating me, and this is the greatest gift I’ve ever had. I can speak and write in Italian very well. I can speak and write English and French quite well. I can read and speak a little German (I’m out of practice). I can understand and speak a little Spanish. I can use the computer. I know how to do everything on it, actually by now it’s the computer that uses me. I know how to travel. I know how to speak in public, indeed I’m told I’m rather good at speaking at events such as conferences, seminars, lessons, radio and TV transmissions and the like. I know how to read poetry, and I love doing so. I’m really good at writing short articles and long essays, maybe even stories. I know how to work like a beast of burden, if need be. I know how to loaf about without time limits, when possible. I know how to win the trust of those who turn to me with an open and sincere heart. I know how to battle those who address me with a malicious or two-faced heart. I know how to understand whether a wine or food is good or not, I know how to describe and explain why. I know how to talk with kids under the age of two (those who don’t know how to talk yet), and with dogs too. I know how to talk with works of art; or more exactly, I know they are true works of art precisely because we start communicating. I know how to run one hour a day, recover and then run again the next day. I also know how to stop doing sports and go back to weighing 90 kg after having succeeded in getting down to 79 two years ago. And I know how to have good intentions to get me back in shape this year. In the meantime I’ve become infatuated with bicycles. I do quite a few kilometers with my road bike, and I use my Grand Touring bike daily. I had returned to weighing – ahem… 98 kg! Having resumed biking, now I’m back to 90. My good intentions are always aimed at 79. How long will it take, though, who knows? I don’t know how to excel in any physical sport, although since May of 2003 I have taken up sports again intensely – running and bodybuilding – and I’m really enjoying it. I don’t know how to stay tied down doing routine tasks, but every now and then I do it and relax. I don’t know how to say yes when I think no, and vice versa, under any circumstances and to anyone. I don’t know how to give up my freedom to think and to say what I think, and never will. I still don’t know how to come to terms with the only real problem all of us must face: sooner or later we all have to die.